Graphic was made using the new Happy Hour Doodles. am glad to welcome 2010. I am always happy to see a new year. A new year always feels like a fresh start. A chance at something new and better. But then I also like Mondays for all those same reasons. It took me YEARS to notice that almost no one likes Mondays. So on this first day of the new year I wish everyone health, wealth and happiness. Or at least a fresh start. 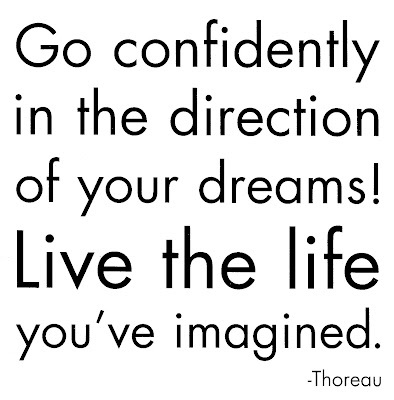 And if you don't go confidently in the direction of your dreams THIS year when will you? RAE: I like a new year like I like Mondays. It is a fresh start, a chance to do better or maybe do something different. JOHN: Iâ€™d prefer orderliness. Routine in a sense in support of orderliness! I mean, I like a challenge and I like to see what sticks to the creative wall, but in a real sense, I like my row of ducks tidy before moving into uncharted waters. Question is, whenever are the ducks tidy? But this fits right into the things I excel at. Example: I am a fairly good golfer. But the key to being a good golfer is routine. Put another way, I would have been exceptionally good on an assembly line. I would have been the guy who would have found the most efficient, fastest way to assemble widgets. It all comes down to routine and execution. And I hope Iâ€™m not as boring as I sound! RAE: 2008 finds John and I working together from home for over a month now. We have settled into a surprisingly nice work routine. He job hunts, I make fonts, blog and work on my website redesign. This is after John has gotten over the fact that all days at home feel like Saturday to him. I am less rigid about my working in my head in total silence routine, or I am trying to be. JOHN: I love my wife... (does anyone hear a big BUT coming?) ... BUT, I do enjoy a bit of quiet solitude in which to work most times. I am not as productive when there is music, a TV going, etc. In one productivity seminar I attended, they said the brain really does only ONE thing at a time. My ADHD tendencies tend to easily allow distractions to overcome workflow. RAE: I must say that John has slid easily into the life of working from home. What has taken me years to accomplish in bad behavior he has exceeded in just weeks. Any of you who know John would know how skilled he is in that area. John = Peter Pan, Rae = Wendy. JOHN: Frankly, I have no idea what sheâ€™s talking about! Bad Behavior? ME? I simply recognize, on some days, that the flannel pajamas offer me comfort during this time of emotional turmoil! Ah hell...who am I kidding? I donâ€™t think Iâ€™ve been out of the house since October! Who will notice if I indulge in comfort clothes? I deserve it! So, there! Mr. Manly wears flannel pajamas during the day. Sensitive? ME? Sensitive? Well, of course I am! Thatâ€™s my allure..along with the flannel pajamas! RAE: So I am feeling happy about the fresh start of 2008. And I know we will be doing something different and I can only imagine better. JOHN: If being unemployed is anything like being retired...I need a job! At least during winter in Wisconsin!